I have noticed something disturbing about my work habits or lack thereof. When I start feeling overwhelmed or feel like I have a lot going on, I give up on writing for the rest of the week. Instead of figuring out when the next actual available time to work will be, I look ahead to the whole week at once, shrink in horror, and spend any down time I do get rebelling and denying as hard as I can. And projecting to “next week,” when this will all be over and things will be different. Something else, not related, that I have noticed lately: it is really, really easy to talk about television! Even KFC, a writing group full of book people, ended up talking about television a lot at our last meeting. And when I cast around for a conversation topic, TV usually works. Have I mentioned that Sanguinity and I are watching Twin Peaks for the first time? It’s finally a sunny week here in Portland. On my bus ride this morning, the sky was blue with small perfect clouds in the distance. It was so storybook perfect that for a second I wondered if I might be dreaming, or part of a movie or simulation without realizing it. I am prone to this kind of paranoia on the bus, suddenly wondering if everyone but me is psychic and can hear my thoughts and so on. Fourgates pointed me to a guy who’s testing the “10,000 hours” concept on golf! He’s at the one-year mark. I envy his metrics and coaching team. 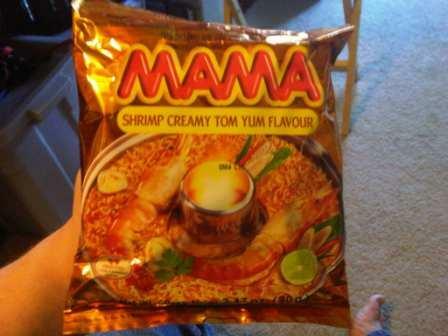 How many inches of ramen in a packet? Cockeyed.com measured. I’m actually liking a lot of things on that website, including the costumes and how he documents failures as well as successes. 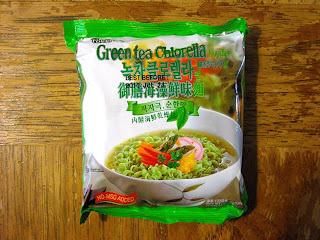 I was at FuBonn again over the weekend, and felt so knowledgeable when I grabbed the multi-pack of Paldo Green Tea Chlorella ramen, because I knew I liked it! But I also got some new varieties to sample. I was wary of the “creamy” part, but this was delicious ramen! The noodles themselves were dusted with spice, and the seasoning packets separated out the tamarindish paste, the regular powder seasoning (with creamer), and a small sub-compartment with the hot chile powder. Okay, it wasn’t quite the same as fresh tom kha, but it reminded me of it in all the right ways. Here’s a review from ramenrater. They didn’t like it as much as I did. And, from the Guardian via @bittman (Mark Bittman’s twitter stream), this fascinating 2005 history and defense of MSG. Google tells me I’m not the only one who sees “MSG” and thinks “Ever So Much More So”! The Anti-IPRC. Oh, and ramen. Sanguinity alerted me to this photo of the laminator and workspace for making signs at the Westboro Baptist Church. “They have their own IPRC!” she said. I’m obscurely pleased by the idea of an anti-IPRC out there. Competitive laminating. Makes me want to make some zines. On twitter today I mentioned that I like George Winston’s music, so maybe today is my day for unpopular opinions. Sang and I split the last packet of our FuBonn ramen– Ve Wong Vegetarian Flavor. I didn’t have high expectations, so when I cut open the nondescript oil packet and found it was fragrant sesame oil, I perked up fast. The noodles were yellow and not too thick; the broth had seaweed scraps, my favorite. It also had carrot chunks, which make me think of Lipton Cup-a-Soup, and crumbs of fake-hamburger-style TVP, which Sang found gross. 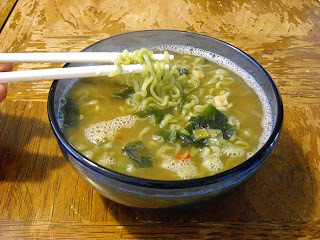 It’s not the One True Ramen, but the sesame and seaweed appealed to me enough that I’d include it in future assortments. Today felt like a Friday, but tomorrow really is Friday. And the roof people expect to be done with our house tomorrow! I expect to be broke but happy. “It’s not that kind of a book,” he told her. Macon laughed and signaled for their bill. the sour, bitter taste of the soup is on purpose. that is because when korean people (such as myself) stir-fry their kimci, it’s the usually leftover kimchi that’s been sitting in the fridge for a while. many people (at least 1/3 of korean, as far as i know.) prefer this type of sour, slightly bitter tasting kimchi over the fresh kimchi. I liked it; it’s going on the shortlist to buy again. Sometime. I have one more ramen packet to try, but I won’t make another shopping trip right away. Apparently when left to my own devices I’ll eat ramen almost every day, and I’m not running the mileage to soak up so many calories and salt mg! I’m thinking about a four-year-old today. He’s the son of a friend we had coffee with today– he was at preschool during our visit, but we got to meet his beautiful baby sister for the first time. She’s still in eat-and-sleep mode mostly, though I think she appreciated Sang’s funny faces. It was wonderful to meet her and to see her mom for the first time in a few months! My four-year-old friend (can I call him my friend if we visited when he wasn’t there and probably no one will tell him? On purpose?) is having a hard time. His family changed, and he didn’t have a choice about it. His mom– his mom!— can’t play with him as much as she did before. He loves the baby (sometimes?) and definitely wants the baby to interact with him, but the baby is not so interactive yet, so that mostly means making the baby cry. That, plus watching the baby devote her entire, serious energy to growing at a rate that would be like my putting on ten or fifteen pounds a week, plus wiring up vast numbers of brain cells… well, when people talk about childhood as simple and innocent and carefree, I wonder why their minds are misleading them so. Ramen! Yesterday I had something called “snack noodle soup,” a mildly spicy Korean packet. I think I’m developing a brand fondness for Paldo (they also made the green ramen) noodles: they’re chewier and more golden than Maruchan. Today I tried Unif Tung-I Instant Rice Noodles: Chinese Onion Flavor. I was excited to see this flavor at FuBonn, but didn’t eat them right away because I usually prefer ramen noodles to rice noodles. I opened the oil packet, which was half white fat and half reddish-brown onion paste, and was scared. You know that fried onion smell, like the cans of french-fried onions you sprinkle on top of green bean casserole? It smelled like that. Like the onion smell that’s hard to wash off my hands sometimes. I like it and then soon I can’t stand it. I liked it in the rice noodles, as it turns out. I suspect that if I had this a few more times, I’d get kind of hooked on it, as happens sometimes with scary chip seasonings. But I don’t think I’ll go out of my way to make that happen. First of all, I concur entirely with Cheaper Than Food on the qualities of Nissin curry-flavored ramen. The powder was just a powder. I wouldn’t turn down a stash of this one, but won’t be seeking it out. I have this very complicated schedule for the new year. On weekday mornings I walk to work with friends (2x per week), go running and catch the late bus (1x per week), read the internet and catch the medium bus (1x per week), or catch the early bus and do some writing downtown (1x per week). I map it all out in my moleskine planner. Maybe no routine will seem onerous if I have to execute it only once or twice a week. And I even have an internet-reading goof-off morning! Afternoons are similar. And on two of them each week, I go to the university library after work for a generous hour’s writing. This week is the first week of the term, and students are everywhere with their bags from the bookstore and their cell phones and their bikes and backpacks. They study mostly in groups, it seems like, at the wooden tables along the curved glass face of the library building, on the second floor. Yesterday I snagged the end table and could look down at the greenery and all the people walking from building to building and across the park blocks. There was a low buzz of students talking, but I had room to spread out my notebook and the book I was reading and a copy of the story I was revising, and work in peace. I went back and forth between reading and writing, revising and taking dictation of new sentences that came into my head. It occurred to me that when I was a college student, I was always wishing that I had time just to read and write. To work on what I felt like working on, instead of miserably cramming down books and dredging up papers. Well, that time has come. Maybe only a few hours a week, but I love sitting in the university library and not being a university student. It is the perfect disguise, better than sitting in a coffee shop. The people at the other tables are doing stuff they have to do (99 percent of them, anyway), but I get to work at my own pace, to my own standards, work on four different things if I want. I love those hours. What’s a writer’s life without ramen? On a recent trip to FuBonn (the big Asian supermarket in my part of town), I hit the instant noodle aisle and bought one packet each of whatever caught my eye. I always tell myself I’ll find my One True Ramen that way and stock up next time I come in, but then I always fail to keep good records. I have this problem with unusual squash, melon, and citrus varieties, too. Blog and tags to the rescue! The veggies rehydrated to nice-sized seaweed scraps, which I love. The noodles kept both their shape and a pretty green tinge, and the flavor was a mellow blend of garlic, cuttlefish, and vegetables. I’ll definitely get this again next time I see it! Now to the evening’s writing work: I have seven days to get a story in shape for the IPRC student anthology, if I want to be in it. I feel like a one-trick pony with this story because it’s been my workshop piece, reading piece, mentor-review piece, et cetera ad nauseum. I suppose the remedy is to write something new, huh? But revisions need to happen sooner or later whether it goes to the anthology or not, so now I’m going to clean up my desk and set out all my notes and copies and start working, so I can come back to it all week.